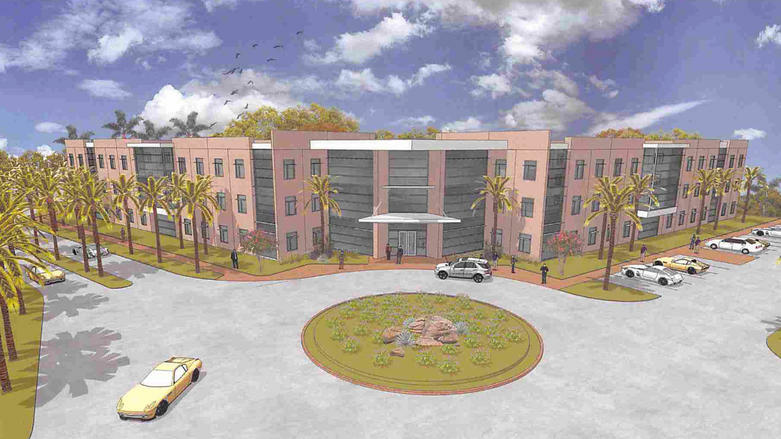 A draft rendering of the proposed Jacksonville University academic health center at 3412 University Blvd. N. is included in an application to the city to modify the site. 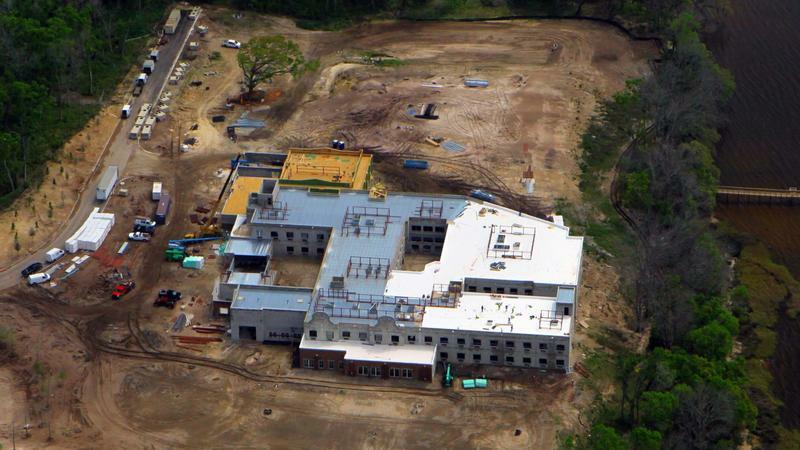 A March 23 aerial photograph of the 120-room Dolphin Pointe Health Care skilled nursing center under construction north of Jacksonville University. Jacksonville University, the 84-year-old private liberal arts college based in Arlington, continues to transform its 260-acre campus. Property to the north is becoming a health care center for teaching, learning and serving, according to our Daily Record news partner. JU has been taking solid steps toward adding two significant structures – a medical building on the property to the north as well as a welcome center on the main campus at 2800 University Blvd. N.
A three-story, 105,000-square-foot medical arts and health sciences building is planned on 6.6 acres at 3412 University Blvd. N.
The site is part of the almost 55-acre Dolphin Pointe Landing, which is owned by OLT II Inc. The ownership is led by JU graduate Gregory Nelson, who is based in Dayton, Ohio. Taylor & White Inc. is the civil engineer. The medical structure is planned at northwest University Boulevard and Dolphin Pointe Boulevard. “This building is part of our continuing partnership with Dolphin Pointe to create an integrated medical community,” said Margaret Dees, senior vice president of enrollment and communications. Already under development is Dolphin Pointe Health Care, a two-story, 100,000-square-foot, 120-suite skilled nursing center. Development began in December 2016. The new building is another phase at Dolphin Pointe Landing. 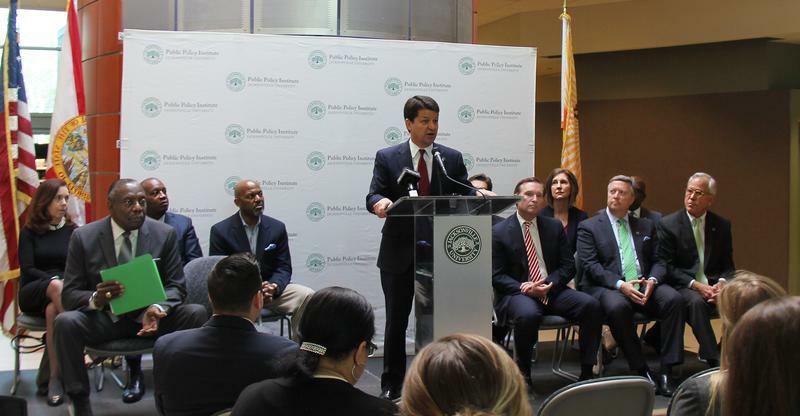 “We are continuing to advance plans to house our growing health sciences students and we anticipate as Dolphin Pointe develops that our students will be fully integrated into that community and this will ultimately provide them with excellent opportunities for clinical practice training,” said Chris Sapienza, dean of the Brooks Rehabilitation College of Healthcare Sciences. JU reported previously the three-phase project is envisioned to include assisted and independent living and provide as many as 500 long-term jobs in the Arlington community. Nelson applied to the city to amend the Planned Unit Development of the property to account for a previous sale of 4.88 acres for construction of dorms. He also wants to increase the maximum height of the structures on one of the parcels to 60 feet to accommodate the three-story medical center. “The proposed building will contain a mix of health related series including: orthodontics, urgent care, occupational therapy, a mental health clinic, a speech clinic, administration, health related learning centers, support areas, and related and similar uses,” the application says. The Rogers Towers law firm is the applicant for Nelson. The project is expected to provide real-world learning experiences to students at the university’s Brooks Rehabilitation College of Healthcare Sciences. The St. Johns River Water Management District is reviewing a permit application and the city has issued a Concurrency Reservation Certificate for the medical building. The district said it intended to grant a permit. JU plans a welcome center, which also will be used as an admissions center, on less than an acre near the entrance to its main campus. The single-story, 11,750-square-foot building is planned between the Gooding and Howard Administration buildings. The district and city are reviewing those plans, too. Prosser Inc. is the civil engineer. Dees said it’s been a longtime goal to create a dedicated visitors center to showcase the campus. “Our enrollment growth and the increase in guests to campus over the last five years certainly moved the need for such a place up on our priorities,” Dees said. “In the last year alone, we had almost 10,000 visitors and guests for campus visits, tours and admissions events – nearly 4,000 more than just three years ago,” she said. Fall 2017 enrollment was 4,222. While almost two-thirds of the resident students are from Florida, the population at the campus represents 48 states and almost 50 countries. There are 580 student athletes. You can read a longer version of this story on the Daily Record’s website, which includes a look at a bond issue in review that could total as much as $50 million. 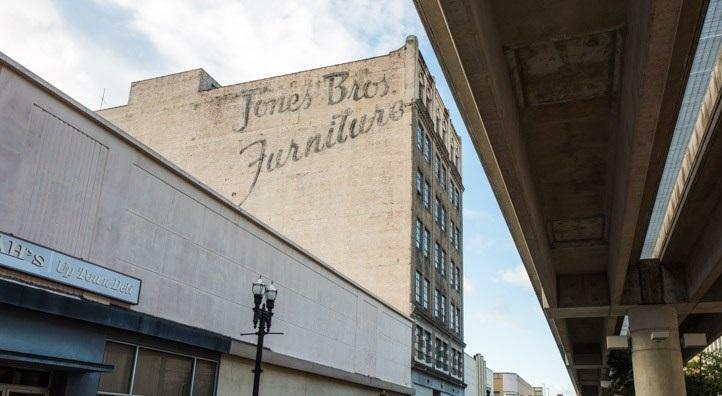 The Downtown Investment Authority Wednesday approved two downtown development proposals — the renovation of the old Jones Brothers Furniture building and the Jacksonville University film school’s move to WJCT Studios. The Jones building project stirred up the most debate. Jacksonville University on Thursday announced a new fellowship program aimed at creating the city’s next African-American leaders.